Last week we had a round-up of some of great titles now available on the Theology list at Bloomsbury T&T Clark. This week follows with the same from the Biblical Studies list. First up, we have our new addition to our Approaches series with the new offering from Michael A. Lyons, An Introduction to the Study of Ezekiel. After explaining how the message of the prophet was relevant to the exilic situation in which he lived, this thorough guide shows how later generations shaped, transmitted, and used Ezekiel in their own communities. The book summarizes the literary shape and contents of Ezekiel, then examines the theories and methodologies used in current scholarship that explain the formation of Ezekiel. Next up we have Reception History and Biblical Studies, edited by John William Lyons and Emma England, released into our (relatively) new Scriptural Traces series. This new addition to a series which focuses on Reception History of the Bible begins to chart the near-infinite series of events that have been generated by the journey of the biblical texts down through the centuries. The chapters consider aspects as diverse as political and economic factors, cultural location, the discipline of Biblical Studies itself, and the impact of preconceptions upon reception history. Articles are contributed by Susan Gillingham, James Crossley, Roland Boer and Helen Jacobus, amongst others. Next up, there is Going Up and Going Down published into our Library of Hebrew Bible/Old Testament Studies series, by Yitzhak Itzik Pelag. Pelag argues that Jacob's dream should be understood as a symbolic dream function to explain its meaning. Thus, the vision, and the movement of the angels is not embellishment or scenic background, but rather symbolizes the path taken by the Patriarchs to and from the Promised Land. Finally, we have Written to Serve, published into our Library of New Testament Studies series by Benjamin Sargent. Benjamin Sargent offers an up to date and comprehensive analysis of how 1 Pet 1.10-12 offers a 'hermeneutic,' providing an insight into how Scripture is interpreted in the letter. He argues that the primary importance of 1.10-12 is its orientation of the prophetic witness towards the eschatological community as an act of service, and that it can be seen to suggest a narrative of profound discontinuity. 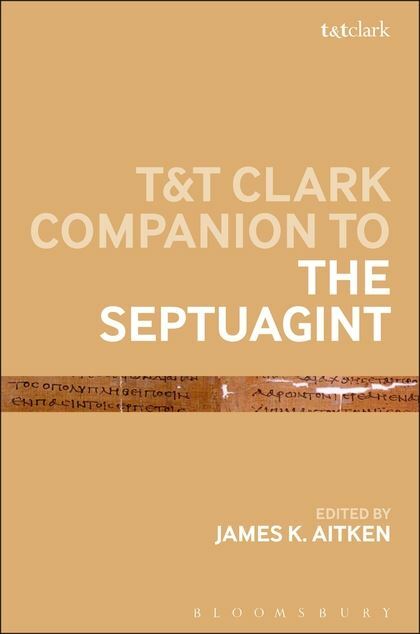 As if a podcast on the Companion to the Septuagint isn't enough we are also kicking off our new 'book of the month' initiative with a special offer on it until the end of May. Yes, you can get this stunning new reference resource for 35% off the list price. It's as if SBL's come early. Easter is nearly upon us, and to celebrate the revitalisation of life, we thought it would be a good idea to do a round up of all of the exciting new publications from T&T Clark this March. First up, we have Fully Alive by Jason A. Fout. Fout examines the work of Karl Barth and Hans Urs von Balthasar and illustrates how each theologian reveals God's glory to the human perspective. Next up we have Theology and Literature after Postmodernity, edited by Zoë Lehmann Imfeld, Peter Hampson and Alison Milbank. This edited collection analyses how theology can remain alert and responsive to the challenges posed to it in postmodernism and postmodern literary criticism, through an examination of various literary texts, from Shakespeare and Wordsworth through to Graham Greene and Lionel Shriver. 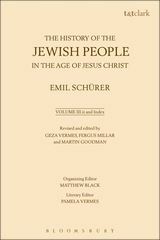 On to the Biblical Studies side of Bloomsbury T&T Clark, we have Josephus' Interpretation of the Books of Samuel by Michael Avioz, published into the Library of Second Temple Studies Series. Avioz analyses Josephus' methodology in rewriting the books of Samuel as part of his Judean antiquities. This is the definitive exploration of the encounter between the ancient texts. Finally, in the Library of New Testament Studies series there is Crucifixion and New Creation by Jeff Hubing. Hubing looks at the epistolary form and function of Galatians 6.11-17 and reveals the theme of persecution to be of utmost importance in establishing a bond between all parties, both those addressed and he who addresses. Hubing goes on to investigate the implications of the message of Christ on the issue of persecution. To buy any of these excellent books, or for more information on them, click here. And a very happy Easter to you all! God bless. 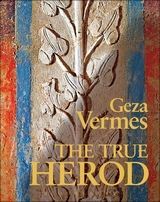 Professor Joan Taylor (King's College London) talks about Geza Vermes' final book 'The True Herod' and about her own journey into academia. Includes a reading from the final chapter of the book, rehabilitating Herod from the popular vision of him as the great slaughterer of the innocents. Perfect for Christmas! Listen to the podcast on this page using the player above. Alternatively, you can download it from iTunes or download it as an MP3. We are pleased to give you details of some of our most recent New in Paperbacks from T&T Clark, published in September 2014. The first up is Women in the Greetings of Romans 16.1-16 by Susan Mathew, which is part of our Library of New Testament Studies series. Susan Mathew examines the structures of mutuality in Romans, to shed light on the issue of women's leadership in Pauline theology. Mathew begins by analyzing the general form of greetings in the Pauline letters, to illuminate the specific form of the greetings in Rom 16.1-16. Mathew couples this with analysis of the leadership of women in the Greco-Roman world, showing that women's leadership roles in the Pauline churches were part of this wider culture. Developing a model of mutuality, Mathew draws together the strands of the Pauline ethos of mutuality, and argues that the leadership roles of women are encouraged in the greetings at the end of Romans . Daniel K. Darko argues that Ephesians 4.17-6.9 exhibits a consistent strategy of promoting group distinctiveness, while utilizing Greco-Roman ethical values and traditions to promote internal cohesion among the readers. Readers are encouraged neither to separate from society nor to integrate further into it, but to live and function within society as members of the ‘household of God' in one accord. Lee introduces the synchronic readings of Polzin, Hawk and Winther-Nielsen, as well as their attempts to uncover the problems in applying their methods to this complicated text. For the purpose of reading the literary history of Joshua 3-4 in a diachronic way, Lee considers what position this text holds in the setting of the wider context of the ark narratives and water-crossing stories in the Old Testament, e.g. the crossing of the Red Sea in Exodus 13.17-14.31 and with Elijah and Elisha crossing the river in 2 kings 2. He examines the recent trends in literary criticism and attempts to trace the most probable literary history of Joshua 3-4. Bos argues that the book of Hosea ought to be understood and read as a text that was composed in Persian-period Yehud rather than in eight-century Israel. The author challenges traditional scholarship and emphasizes that there is the evidence to suggest that the book should be viewed as a Judahite text - a book that was composed in the late sixth or early fifth century B.C.E. In this podcast Dominic Mattos, Publisher for T&T Clark, talks to Professor Francesca Stavrakopoulou about her books Land of Our Fathers (T&T Clark, 2010) and Religious Diversity in Ancient Israel and Judah (T&T Clark, 2010) and about the challenges and opportunities facing biblical studies as a discipline. Francesca Stavrakopoulou is Professor of Hebrew Bible and Ancient Religion at the University of Exeter, UK. Her research focuses on ancient Israelite religion, Judahite kingship, and history and ideology in the Hebrew Bible. She recently wrote an article in The Guardian about gender issues with regards to how to dress in academia, which you can find here. 1. What particular areas or themes of Biblical Studies interest you and why? Every time I read a biblical text, I cannot avoid asking about the people who wrote or handled the text. Who were these people and what were their lives like? In my view, one should ask why does this text exist? Why did an ancient scribe, or a group of scribes, or a series of generations of scribes, produce the words that I now see on this page? What was the point? In my view, the Bible’s status as sacred literature has undermined the Bible. I am not convinced it was designed to be sacred literature. It is an anthology, and the anthology includes incredible diversity. Who produced this anthology and why? What was the Bible before it got saddled with the unenviable status of sacred writ? That question is the drive train of my research and teaching. 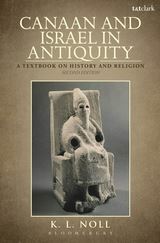 Canaan and Israel in Antiquity is a one-volume introduction to ancient Israel’s history, which stresses both the evidence and the necessary methods for evaluating that evidence. 3. What do you think makes the Second Edition particularly useful for teachers/on courses? The second edition is a vast improvement over the first, because it includes a chapter that explains what an ancient Near Eastern patron god was, and how the ideology of divine patronage shaped biblical literature. In the classroom, I have found that students need a specific focus on that topic so that they can begin to understand the strange divine personality they encounter in the pages of the Bible. Also, the first edition had made its mark by being the only English-language textbook that helped a student understand basic research method, but the second edition has improved on the first by devoting even more careful attention to matters of method. Even if my reader has no background in this field of study, the reader will achieve a strong competence because this volume enables the reader to understand how we draw conclusions about people who lived their lives and died more than two thousand years ago. It walks through the steps of gathering the data, evaluating the data, and constructing a portrait of the past. 4. Which part of the book did you enjoy writing the most? I guess what excites me most is giving my student the tools for deconstructing the simplistic assertions that one so often encounters about the Bible and the people who produced the Bible. Much of the conventional wisdom about biblical literature and biblical history is incorrect. Even many biblical scholars who should know better pay lip service to the tedious notion that biblical texts were designed to proclaim a religious message among a vast, illiterate agrarian people, and that most ancient Israelites were familiar with the texts contained in the Bible, such as the tale of Moses and the exodus. If genuine understanding of these ancient people and their literature is to be achieved, those conventional truisms must be dismantled. Reality is so much more interesting than the modern folktale that emerges when people try to squeeze the many and varied narratives and poetry of the Bible into an awkward harmonization with ancient evidence. By doing that, they do violence to the ancient evidence and they insult the ancient scribes who produced the biblical literature. 5. Any tips for people reading the book or using it in their studies? This book is written in a particular order, so that a student who has little or no background can advance step-by-step to a clear understanding of the ancient evidence and proper research methods. So my advice for a reader is to start with chapter 1 and do not skip around in the book, at least not during the first reading. Chapter 2 builds on chapter 1, and chapter 3 builds on chapter 2, and so forth. With this book, steady attentiveness is rewarded. 6. What is next in your research projects? Currently, I am trying to bring together more than a dozen years of peer-reviewed essays and articles, add some additional insights, and produce a book that will, I hope, define some positive advances that can be made in our field if researchers will just let go of some tired truisms that linger in our field in spite of the overwhelming evidence against those truisms. For example, the hypothesis that portions of the Former Prophets once constituted a Deuteronomistic History retards any genuine advance in the study of the Former Prophets. I hope my next publication will enable scholarship to get past that roadblock in their thinking. But, as always, my greatest joy is the classroom. I am passionate about the people of the ancient past, and I want to find ever-new ways to bring that passion into the lives of my students. The season of mists and mellow fruitfulness feels as if it's well upon us, and those heady days of summer when the year still seemed to be in its prime now register only as dim memories. The jungle-drums of panic are already starting to beat away for SBL/AAR, and I'm considering just not bothering unpacking my last conference bag and hoping that whatever clothing I wore for the last gig will miraculously wash itself and be appropriate for San Diego. But what a conference season it was for Biblical Studies this year. For me it kicked off with the wonderful Jesus and Brian conference at King's College London, which included the cracking line from John Cleese; 'if someone were to ask me what the most interesting thing to come out of Monty Python was I'd be tempted to say this conference'. I'm thrilled that we'll be publishing the book of the conference in August next year (if everything goes to plan). The Jesus and Brian papers were uniformly excellent. I particularly enjoyed George Brooke's, which included another great line; 'after all the Pythons had done more than most of my students do, they'd actually read the Dead Sea Scrolls'.If you're interested, T&T Clark live-tweeted the conference ---and you should be able to find soundbites on our twitter feed quite easily. ISBL in Vienna followed shortly after we'd looked on the bright side of life, and I had many profitable meetings in between slabs of sacher torte and Wiener melange. I also shared a 'Viennese Sausage Experience' in what later turned out to be a favourite cafe of Freud's. My dining partner and I decided we wouldn't analyse that one too much. It was particularly great to catch up with series editors, and publishing colleagues and friends from other houses. Next in line was SOTS - which I didn't attend myself. This was a great sadness as I was looking forward to John Day's presidential conference. I still remember his lectures on Genesis 1-11 from my student days. They were very good - as evidenced by the fact that I actually went to them. We were represented at SOTS by Miriam Cantwell and Matt Porter. I've heard it was a great conference, and that a particular highlight was John J. Collins' paper on 'Torah and Jewish Identity in the Second Temple Period'. Whilst SOTS was going on I was in Providence, RI, for the meeting of the Catholic Biblical Association. This was great fun, and the Dominicans hosted the event wonderfully. Great to see so many young friars. White habits everywhere. The seafood in Providence was truly excellent as well. After CBA came SNTS in Szeged, which from Providence was a time-difference I didn't particularly enjoy. This conference was superbly organised, which makes a huge difference for us publishers. I enjoyed Keith Elliot's paper on the historical critical method... which included a cheeky line that went something like this; 'sometimes might it be best to admit that we do not know what the text means?' Lots of thumping great bowls of goulash for all to enjoy at the conference dinners. I also enjoyed eating Magalica pork whilst I was there. This comes from a curly-haired breed of pig, and it is delicious. It is the closest we can get to the now-extinct British breed, the Lincolnshire Curlycoat. The Curlycoat became extinct as a direct result of the 1955 Howitt report, which recommended a simplification of pig breeds. Curlycoats were used to help boost the Mangalica stock in Hungary and Austria in the late 50s so there is at least some genetic crossover. This pig story has absolutely nothing to do with Biblical Studies, but it was a valuable part of the conference experience for me. It also reflects just how much attitudes towards food production have changed in the UK since the 1950s. The final conference of the season was BNTC (British New Testament) in Manchester. Great papers from Eric Eve and Rafael Rodriguez on Oral Tradition and the NT. Note Rafael's recent book on the subject. Similarly a great plenary from Professor Joan Taylor on Mary Magdaelene --- trying to find the missing Magdala. It was also nice to see James Crossley's Harnessing Chaos, which appears in our new Reception History sub-series (Scriptural Traces), feature as part of a panel review session. All present enjoyed Jorunn Okland's 'method dressing' approach to the session. A hint as to what this involved can be found on the book's truly extraordinary cover! So a fun summer of conferences. Lots of good conversations. Lots of interesting people. Lots of good food. Now all I have to do is try to sleep, diet, and exercise between now and SBL/AAR... and try to find the will to unpack. Today's publication day, and here at T&T Clark we are excited. With a fantastic array of books across both lists, there's almost too much choice! The Crisis of Confidence in the Catholic Church by Raymond G. Helmick, S.J. James Crossley investigates how the effect of the social upheavals of the 1960s and the economic shift from post-war Keynesian dominance to post-1970s neoliberal dominance brought about certain emphases and nuances in how the Bible is popularly understood, particularly in relation to dominant political ideas. This book reveals the decline of politically radical biblical interpretation in parliamentary politics and the victory of (a modified form of) Margaret Thatcher’s re-reading of the liberal Bible tradition, following the normalisation of (a modified form of) Thatcherism more generally.The result is a reflection on why politicians in English politics bother using the Bible at all. The nature and the practice of Wirkungsgeschichte and reception history are matters of debate and disagreement in contemporary Biblical Studies. Robert Evans addresses three crucial issues in the discussion: the relationship between reception history and historical-critical exegesis; the form of reception history itself, with a focus on the issue of which acts of reception are selected and valorized; and the role of tradition, pre-judgements and theology in relation to reception history. This volume addresses the function and impact of vision and dream accounts in the Hebrew Bible. The contributors explore the exegetical, rhetorical, and structural aspects of the vision and dream accounts in the Hebrew Bible, focusing on prophetic vision reports. This book offers a fresh reading about the purpose for which Hebrews was written. Whitlark argues that Hebrews engages both the negative pressures (persecution) and positive attractions (honor/prosperity) of its audience’s Roman imperial context. Does the apostle Paul sponsor political conservatism? A growing number of scholars dispute this perception, arguing that Paul's political imagery and in particular the confession that "Jesus Christ is Lord" directly challenge the proud Roman emperor.This book critically engages these proposals, seeking to point out with greater precision the function of political imagery within the Pauline narrative. Dorothea H. Bertschmann starts by conversing with the works of John Howard Yoder and Oliver O'Donovan, two modern political ethicists and theologians. All of these books can be bought from the T&T Clark/Bloomsbury site here.